On Saturday at Nunholm, Stafforce Dumfries dented second placed Kelburne’s title hopes with a comfortable five wicket win in the Western Premier League. Elsewhere only leaders Clydesdale were able to finish their game, winning a low scoring encounter at Drumpellier. Batting first, Kelburne reached a final total of 162 all out thanks to resistance by the tail enders after the visitors were languishing at 82 for 7. Opening bowler Niall Alexander had removed the top three and took four wickets for Dumfries. Alan Davidson accounted for the middle order and also finished with four wickets. For Dumfries opening bat Drew Dawson contributed 27 and then Marcus Richardson, batting at three, batted positively for his score of 65. His was the third wicket to fall with fifty runs yet to get but Chris Bellwood with a composed score of 43 and Chris McBride with 16 not out saw the Nunholm side home with twelve overs to spare for the loss of five wickets. 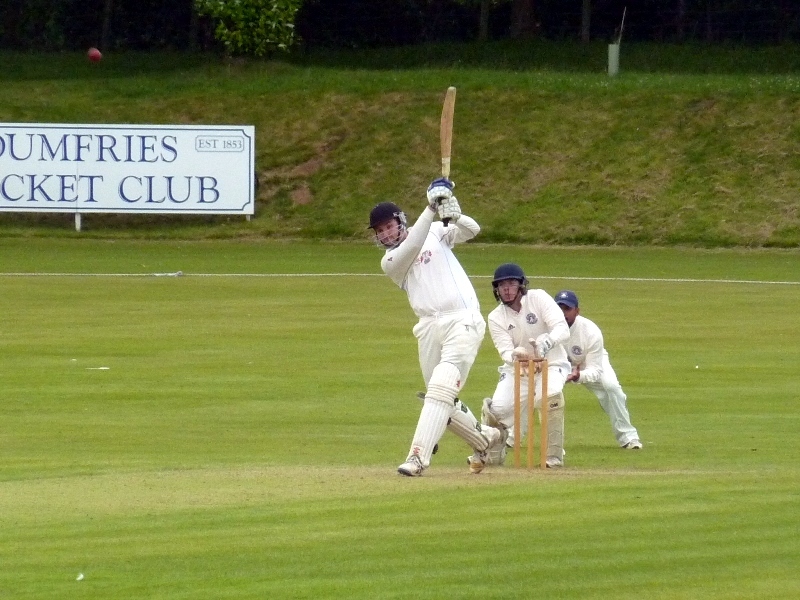 Richardson was the Carlisle Refrigeration Dumfries Man of the Match for his match winning innings which included ten boundaries. Stafforce Dumfries remain in fifth place in the Premier league just behind Ferguslie. In the Western Premier Reserve League, Nunholm lost at Whitehaugh after the home side scored 204 all out with the Barbours Nunholm Man of the Match, Peter Johnstone, taking three wickets. Nunholm reached 92 all out in reply as Milliken took six wickets for Whitehaugh, and on Sunday, four wickets from the Farries, Kirk & McVean Man of the Match, Dave Strachan, were not enough to prevent a three wicket loss in the friendly at Hillhead. Holiday Junior Cricket: Dumfries Cricket Club’s Junior Coaching takes place at Dumfries Sports Club on Mondays over the holidays, 6:15-8, for boys and girls, P4 to S1. For details contact Trefor Williams (01387 256455), or the club on dumfriescricketclub@gmail.com, 07799 856094, or see www.dumfriescricketclub.co.uk, Facebook(dumfriescricketclub) or Twitter(dumfriescricket). A Summer Holiday Cricket Camp, for boys and girls aged 7 to 12, takes place at Nunholm on 5/6th August (Wed/Thu) with beginners welcome. For details please use the above contacts. This Saturday, Dumfries play away at last year’s West Champions, Ayr, who sit two places below them in the Western Premier League, and Nunholm host Ayr 2nds in the Reserve league.